The vision for this project outlined much more than merely a recreation center and site for low income housing – it was designed to serve as a catalyst for community revitalization and redevelopment. Arlington Mill is a central hub of civic activity and contributes to the infrastructure of the Columbia Heights West and Columbia Forest neighborhoods, as well as the greater Columbia Pike community. 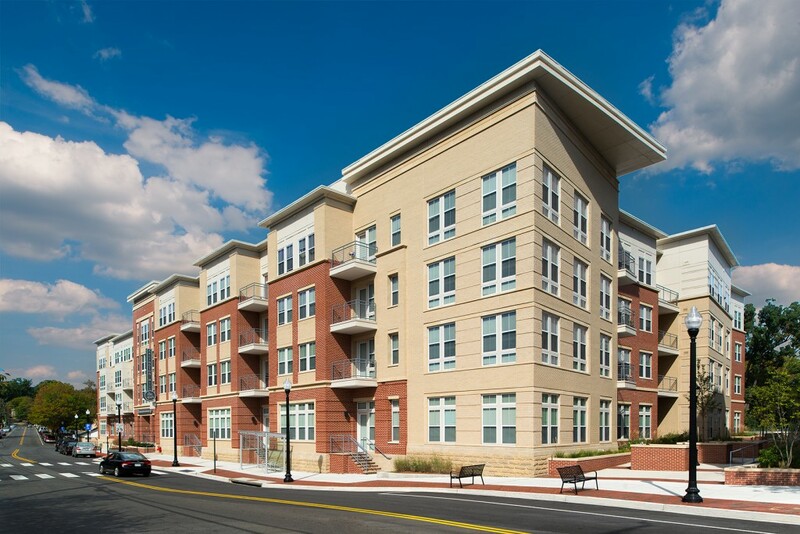 Completed by APAH in February 2014, Arlington Mill Residences is the first new affordable housing development of the Columbia Pike corridor revitalization effort. This four-story, 122-unit complex is 100% affordable and includes 98 two- and three-bedroom units to support larger families and 13 units designated for formerly homeless individuals and families. Last month, Arlington Mill Residences was named EarthCraft Virginia’s “Multi Family New Construction Project of the Year,” and last November it received top honors for “Best Housing Development” at the Virginia Governor’s Housing Conference. The Community and Senior Center is a state-of-the-art facility that brings the community of all ages together in the full-size gym, fitness room, multi-purpose rooms, classrooms and computer center. Green building features, including a green roof, native landscaping, low-flow fixtures and a rain-harvesting system, have earned the project LEED Gold certification. By co-locating the Community Center and the Residences on public land with a shared underground garage and shared infrastructure costs, the project saved nearly $9 million or about $75,000 per unit. The County provided the land to APAH through a discounted ground lease and APAH purchased a share of the common garage. The unique financing structure enabled APAH to successfully compete for Low Income Housing Tax Credits for the $31 million affordable housing development. The $36 million Community Center was financed by the County with a combination of bonds and carry-over funds from FY 2011 and 2012. The County is planning for the next generation of housing affordability, a vital component to the community’s social and economic sustainability. Finance and development tools are used to preserve and create affordable housing in the County. The County Board initiated an Affordable Housing Study in 2012 to evaluate existing policies; assess current programs and resources; and identify needs and gaps in providing affordable housing. The result will be a set of goals and policies that will shape the community’s vision for affordability. In July 2015, the County Board will consider adopting a new Affordable Housing Master Plan as an element of the County’s Comprehensive Plan. To learn more about the County’s affordable housing goals, visit the County website.